Hachiman has always been the outsider. Shunned by classmates as long as he can remember, he's become exceptionally jaded and revels in cynicism. His guidance counselor decides he should socialize more, and requires he join a club dedicated to helping people. It only has one member, Yukino Yukinoshita: a.k.a. the ice princess. A girl named Yui is their first client, and soon decides to join as well. Three unlikely people with an unusual knack for actually solving problems. Where the relationship goes between these three... that gets a little strange. I had an ominous feeling this anime would plunge itself into angst and self loathing. Which would be easy considering strong negative aura surrounding the protagonist. In the first 12 episodes I liked it enough to say it was worth watching, but it wasn't until the the second season that I was really impressed with the quality in the story, and character interactions. 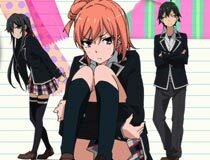 Most plots involve Hachiman saving the day through his unique insight in being an outsider. While colored by negativity, his perception of the world is well thought out and consistent with views only someone who had never been part of an in-group could see. Hachiman's introspective approach becomes the strong point of the anime. Problems surface due to social conflict, so Hachiman's solution is to often become the bad guy, thus manipulating others into unifying against him. 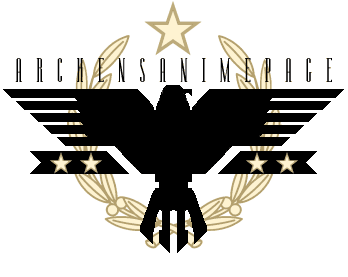 The anime doesn't exactly make this look heroic either. Even if he saves the day this way, in the end he's only hurting himself. That's a surprisingly thoughtful level of depth. The characters are very well developed, but it takes a while to understand them. It's a diverse cast with personalities that play off each other very well, especially in dialog. 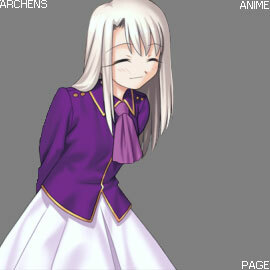 I liked how peripheral characters aren't forgotten, and nearly everyone plays a reoccurring role. Central to the relationships are that between the three in the club, but.. it's almost too complex to explain in a review. It's much more than a love triangle. This anime doesn't exactly have an antagonist, but Hayato is the popular good natured classmate of Harima. His positive outlook, offers a sincere contrast to the views of Hachiman. Both are perceptive of things around them, with opposing dispositions, yet neither are wrong. An intriguing contrast. 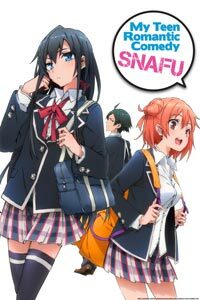 I don't upgrade reviews often, but watching more of My Teen Romantic Comedy SNAFU I realized how good it was. It's a slow process of building relationships, while each new story is interesting too. Well worth the watch, and I'm confident it will continue to maintain this quality. 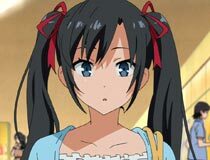 Yukino: Don't reveal your fetishes to girls you've just met. You can't complain if they try to sue you.